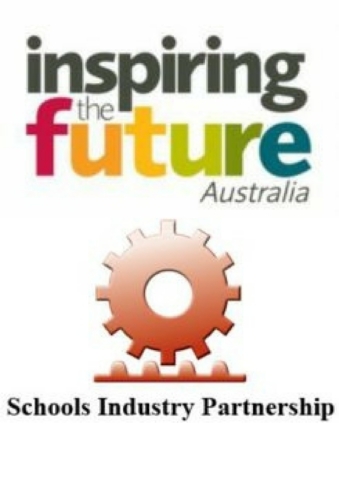 Following the continued success and growing demand of Inspiring the Future and its other campaigns in the UK, weare working in partnership with the Schools Industry Partnership (SIP) who have rolled out the programme in Australia. We are thrilled at the opportunity to raise the aspirations of children on an international scale. The SIP is a not-for-profit incorporated association that has been working to provide work placement coordination in Australia since 1995. Launched on 3 April 2017, Inspiring the Future Australia has been spreading throughout the county with volunteers signed up in every state. Teachers have been rapidly signing up, and praising ITF and the volunteers that are available to them. A dozen events and speaking engagements have successfully taken place since the launch. A report published by the OECD in October 2017, ‘Building Skills for All in Australia: Policy Insights from the Survey of Adult Skills’ cites Inspiring the Future as a notable initiative being used to raise aspirations (page 52). The official launch of ITF Australia involved both the Minister of Western Sydney and the NSW Minister for Education, as well as other high profile guests such as representatives from THALES, the Business Chamber, the Star Entertainment group and the local business community. Teacher’s from surrounding Western Sydney schools and their SRC or Leadership representatives also attended to experience the power of ITF firsthand. Check out the highlight video of the ITF Australia launch by SkillsOneTV. Teachers within Australia have been creative in using ITF volunteers within their schools and utilising their different skills and experiences to fit with student needs and challenges. Cranebrook High School used ITF volunteers to engage their English Studies students in Mock Interviews about their prospective careers. These students were not on a University Pathway and gained great confidence in practicing interview skills and getting feedback from real employers. Read more. 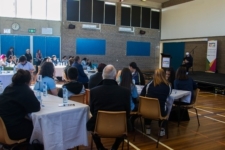 Cambridge Park High School hosted their first inaugural ‘Empowering Education through Culture’ conference, with a keynote Aboriginal speaker and different volunteers with different cultural backgrounds to inspire their Aboriginal and Pacific Islander students through career speed networking. Read more. Cumberland High School used ITF volunteers to educate their Year 10 students about different career options through career speed networking. This activity was part of a large career day, where Year 10 students learnt about resilience, undertook mock interviews and heard from inspirational speakers as well, as a precursor to their work experience and subject selection. Cranebrook High incorporated ITF volunteers into their annual Maths Deadleys for local primaries. 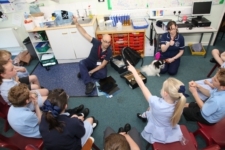 This year, the maths based games circuit event included Inspiring the Future volunteers, pioneering as the first Primary School event under the Inspiring the Future campaign. Read more. 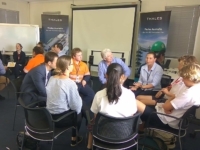 Twelve young people and six teachers from three Sydney secondary schools visited THALES Maritime Ship Repairs to be inspired at the first ITF Workplace visit. The staff at THALES showcased the wide range of employment options with them using interactive career conversations. Read more. NASSA launched Inspiring the Future in Northern Adelaide. 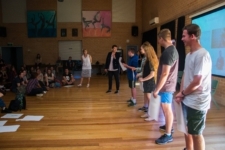 In October 2017, Inspiring the Future was officially launched in South Australia with Northern Adelaide State Secondary Schools Alliance leading the movement. Read more. Winmalee High School ran an ITF workshop to provide their year 10 students with the opportunity to learn about social media for the future. The day was designed to get the students thinking about the impact their online presence can have on their future careers. Read more. 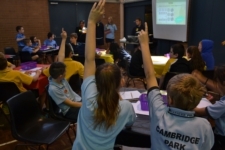 The first Primary Futures event in Australia took place on Friday 4 May 2018. 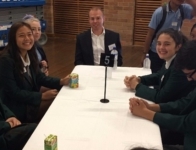 Organised by the Schools Industry Partnership and The Smith Family it took place at Willmot Public School, a small primary school in Mt Druitt, situated in one of the most deprived areas of New South Wales. Taking part in the launch was Anne Denham, Principal, Willmot Public School, Ian Palmer CEO, Schools Industry Partnership and Wendy Field, Head of Policy and Programs at The Smith Family. Education and Employer’s CEO also attended. Primary Futures Australia aims to widen the horizons and aspirations of primary school children, by helping them establish connections between what they are learning now and their futures – focusing in areas of poverty and targeting those who might not otherwise have a chance to meet inspiring role models. In 2018, launches are planned for many sub-campaigns, including Inspiring Futures for Young Women. On 12 June SIP and Inspiring the Future Australia will be launching Inspiring Futures for Young Women in Australia, focusing on raising the profile of careers with low female participation and empowering women to pursue their passion without the fear of gender stereotypes. As ITF Australia continues to grow, you can support the campaign by spreading the word to any Australian contacts you have! Visit the Inspiring the Future Australia website.